It’s now 66 years old and those patches have done well to keep the bridge from falling into Dairy Creek. Though it definitely needs to be replaced, county officials don’t expect it to crumble overnight. The current bridge has a weight-bearing capacity of 13 tons, though that hasn’t stopped long-haul trucks from traversing the bridge with average legal loads of 40 tons, leading the Washington County Sheriff’s office to issue several citations, according to Haughn. UPDATE (Mar. 3) – Sources in the Washington County Sheriff’s office have reported that there are no records of citations being issued by the WCSD for oversized loads crossing the bridge. A new bridge would increase the weight capacity to around 75 tons. “Obviously, replacing a bridge can be expensive,” Haughn said. 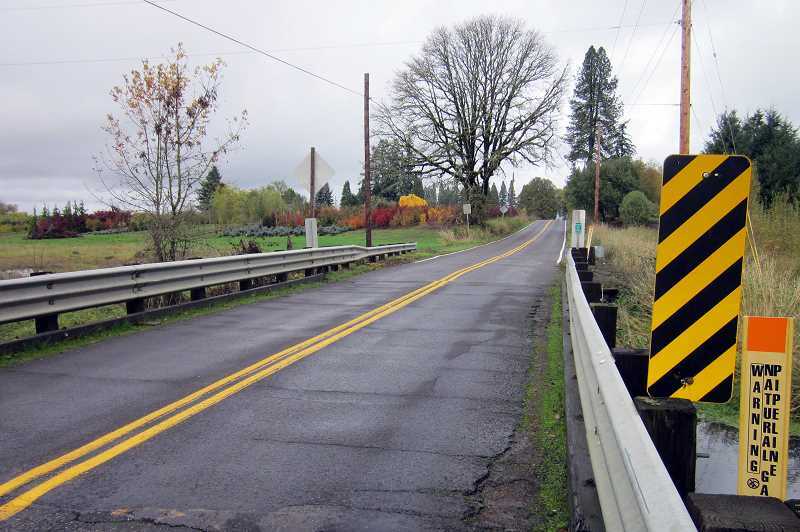 Initially, county officials thought they’d simply restrict the bridge to bikes and pedestrians only, she said, but Porter Road residents and the roughly 1,100 vehicle trips across the bridge daily helped change their minds. “So we don’t want to take the risk of letting it go on any longer,” Haughn said. Using Gain Share funds, county commissioners voted to approve the $990,000 project. Gain Share funds come through a strategic investment program that gives large corporations in Washington County a tax break for supporting lots of local employees. But as part of the program, the corporations agree to give back those tax breaks over the years, to be used for schools and infrastructure projects like the one at Porter Road Bridge. The project will begin in August after Verboort Road closures have concluded as a result of a roundabout installation on Highway 47. Porter Road at the bridge will be closed off for approximately four months.